The Marie Curie Caring for Carers Within Revitalised Communities in Wales project provides a series of free workshops and information sessions to support carers caring for someone living with a terminal illness. The three year project which works in collaboration with local health boards, local authorities and volunteer organisations –aims to empower carers with the knowledge and resilience they need to look after the person they are caring for at home. Among the highlights of the project so far has been the pioneering Carers’ Café initiative, which invites carers to a pop-up café for a cup of tea, slice of cake and an informal chat about their caring. The sessions run on the first and last Tuesday of every month, and already more than 100 carers have visited the café at the Cardiff & the Vale Hospice in Penarth since it opened its doors in March of this year. 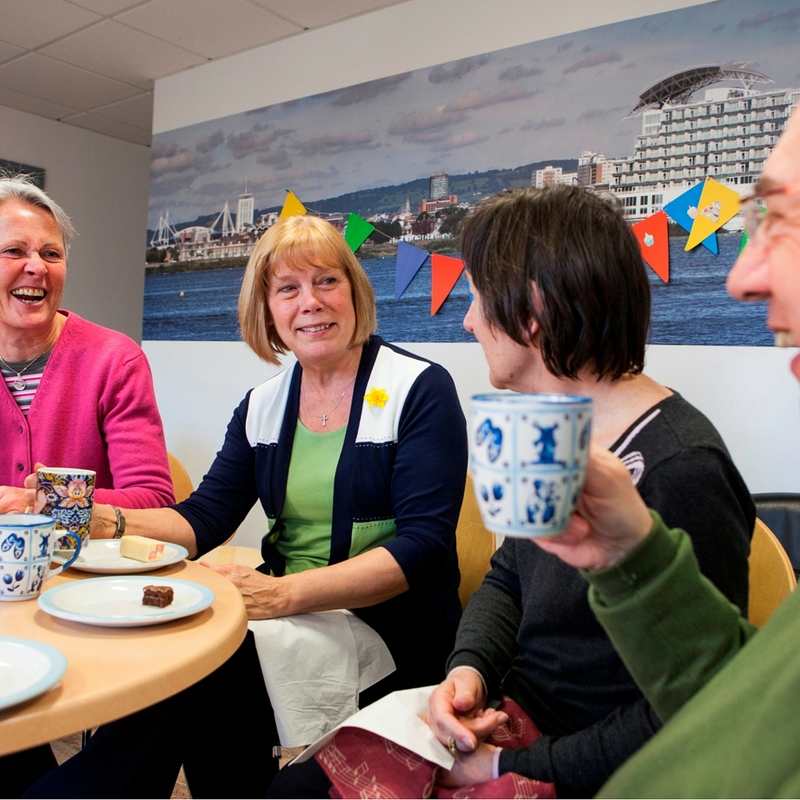 Such has been the success of the scheme, the Marie Curie Caring for Carers in Wales project team has rolled the Carers’ Café out to community events, and are currently exploring options to set up regular events in other areas in Wales. Susan Court, Caring for Carers in Wales Project Manager, said: “The project supports carers caring for someone living with any terminal illness from the point of diagnosis. We aim to ensure that carers are able to access the support and benefits they need to continue to care for their loved ones, while maintaining their own good health and well-being. This early intervention seeks to provide a supportive environment and build resilience and confidence for carers, helping them to continue to face the challenges that the role of care provider presents. While the Carers’ Café scheme might be considered the jewel in the crown of the project, the project team has also held more than 40 information sessions to reach out to carers across Wales. Many of the sessions follow a particular theme, and topics include ‘Time for Me – Mindfulness for Carers’, ‘Am I Doing the Right Thing?’ and ‘Thinking About the Future’. During Carers’ Week, the project worked alongside a number of partners to raise awareness of the issues faced by young carers through a fun and interactive board game. ‘I Care…Do You?’ is being distributed to schools and groups that support young carers and young people across Ceredigion, Carmarthenshire and Pembrokeshire. Elsewhere, the Caring for Carers in Wales project part-funds a dual-role nurse who provides support for carers in homes across North Wales, as well as running awareness sessions out in the community. To find out more about the Marie Curie Caring for Carers in Wales project please visit the project webpage, email susan.court@mariecurie.org.uk or call 02920 426023.